There was a sense of inevitability as New Zealand clawed back a ten point deficit in Brisbane last month and won against Australia in the Rugby Championship with the final kick of the game. Similar was seen last year in Ireland, and that ability to ruthlessly pursue an opponent would put Anton Chigurh to shame. 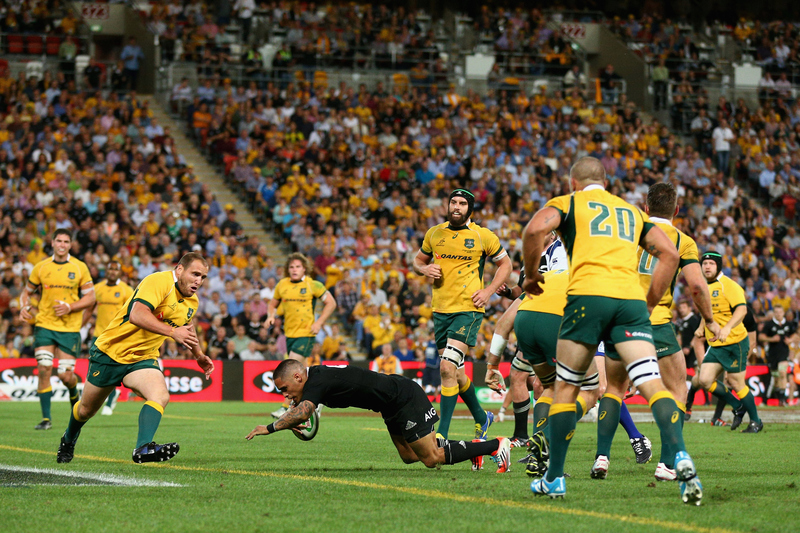 The All Blacks have lost just twice in thirty nine matches since Steve Hansen took charge. Their average winning margin may have dropped from 19 points (June 2012-November 2013) to nine (November 2013- October 2014), but how to beat them remains a conundrum solved rarely. Looking at some rugby statistics, perhaps the focus should be shifted from how to when? 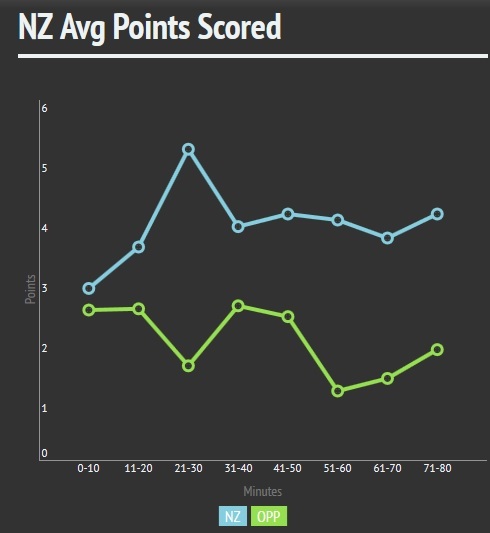 By splitting New Zealand games from 2012-2014 into ten minute segments, their scoring trends can be noted. 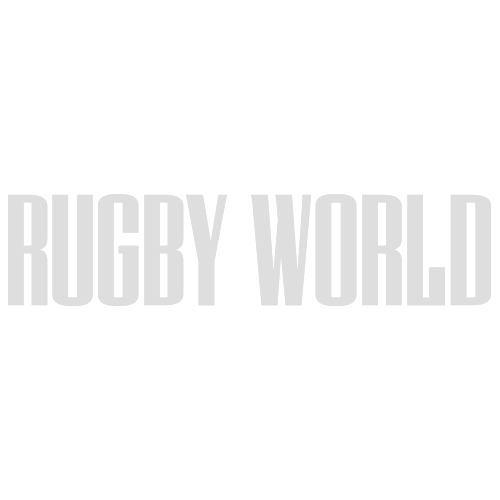 There appears to be two crucial periods in a standard match. Between 21-30 minutes they both increase their own scoring and limit their opponents’, while the 51-60 minute block sees their opponents’ average drop to a low of just 1.15 points. Conventional wisdom may hold that building an early lead is the preferred way to beat the All Blacks. However it can be seen below that they react positively when the opposition go ahead in the opening quarter. Their ability to accelerate the scoring rate in the 21-30 minute period means a slow start can be overcome, while their opponents often fail to maintain their own initially high rate. 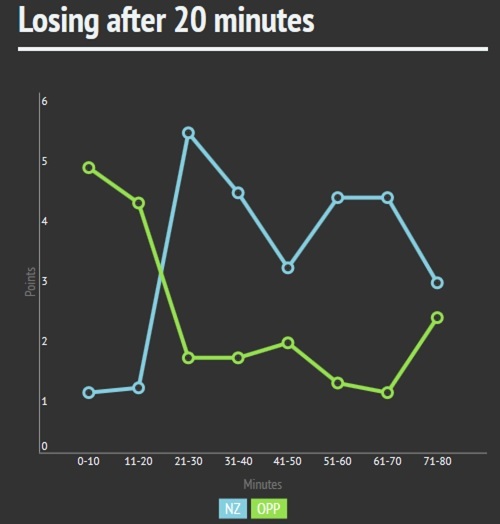 When they have trailed later in games, the main comeback period appears to be the 61-70 minute segment – with an average of 5.33 points scored to 1.77 conceded if they were behind at halftime and 6.5 points to 1.66, when losing after an hour. The mentality of both teams does need to be considered. The 2011 World Cup winners have worked in the past with forensic psychiatrist Dr Ceri Evans to understand and manage pressure. One of the ideas is that ‘red head’ is a distracted state, driven by emotion and with focus on result while ‘blue head’ allows calm, accurate decisions to be made with the spotlight placed on task. In recent interviews, the players have highlighted the importance of process and preparation over outcome, and the significance of the leadership group and trust in the system. That ability to keep a ‘blue head’ and stay connected for the full match has been a crucial element in their comebacks. For an opponent, a match against New Zealand has an added level of hype and importance. 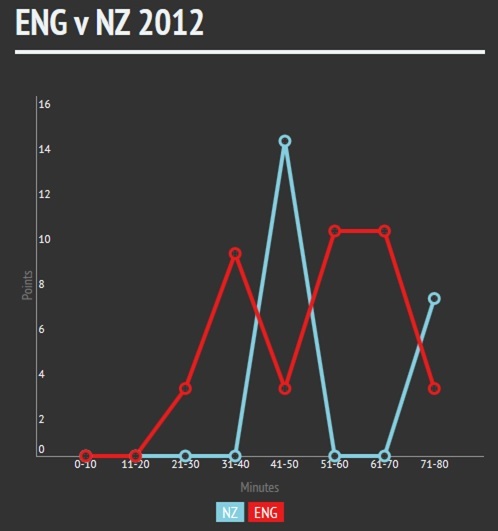 The build-up often references the last time they beat the All Blacks or what effect a victory would have this time. It isn’t uncommon for a side to have taken the lead against them or at least be level after the opening quarter (occurred in 44% of their games 2012-14). It may be the case that loss aversion then kicks in. The style of play that has put them in front is suddenly deemed a ‘risk’ and avoided. At the same time, New Zealand’s players are being motivated by their own strong desire not to lose, so going behind makes them more dangerous. It is possible that the key is to dominate their two usual areas of strength – specifically limiting their scoring 21-30 minutes and then being able to put points on the board between 51-60 minutes. That is something England achieved back in 2012. They kept New Zealand to 0 points after the first quarter, raised their own scoring and then managed three tries between the 53rd and 61st minute. England don’t have the same track record of successfully chasing down an early deficit as New Zealand, having lost on five of the six occasions when they have been behind after twenty minutes since 2012. They do match up well when it comes to the 51-60 minute period though. It has proved their highest scoring section under Stuart Lancaster, with an average of 16% of their points occurring in it. They also concede an average of just 1.5 points in those ten minutes compared to 2.0-2.7 points elsewhere. In their five most recent matches against the All Blacks, they have conceded a combined total of just 3 points between 51-60 minutes. Given a team knows that a New Zealand comeback is highly likely, how to combat it tactically and mentally may feature in their preparation. While England had to effectively beat them twice in that 2012 game (after the visitors revival from 15-0 to 15-14), South Africa were required to respond to two comebacks in Johannesburg recently to secure the win. The ‘keep calm and carry on’ slogan has been horrendously overused, but tag ‘scoring’ on the end and it may apply against New Zealand. To read an in-depth analysis of the haka and RW’s verdict on England’s midfield problem, check out the December issue of Rugby World – in shops now! 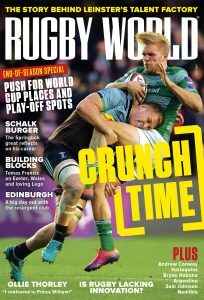 Visit po.st/RWSub for all the latest Rugby World subscription deals, or find out how to download the digital edition of the magazine at po.st/RWDig.